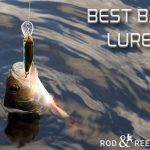 Best Hooks for Trout Fishing | A buyers guide for all your hooks. Best Hooks for Trout Fishing – What size should I use? I love nothing better than landing a well-played Trout. From the initial take right through to the landing is one of the best fishing experiences there is. Trout are a very fussy fish when it comes to bait presentation and fishing technique. One of the most important factors in landing that prized fish is your hook selection. I always err on the side of caution and go for the smallest hook possible when trout fishing. This gives me the advantage of presenting the bait in the most natural way possible. Today lets explore trout hook sizes and the use case for each one to get you landing more fish. A nice Rainbow Trout caught on a small hook baited with sweetcorn. How big are the trout you are fishing for – are they small brook trout or big mature brownies? What bait are you using on the day – maggots or small worms or bigger manufactured bait? The is nothing especially different about trout hooks compared to other fishing hooks bar perhaps the missing points on the shaft of the hook to hold the bait in place. Pictured here is a barbless hook and an overview of the different elements that make up the hook. Shank – This is the straight back of the hook running from the eyelet to the bend. 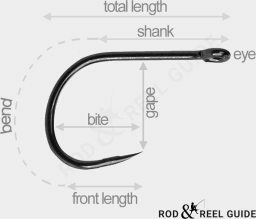 Bend – This is the curve of the hook – this follows a similar pattern among all trout hooks. You will see offset or widened skewed gape similar to Bass hooks. Front-Length – This is the smaller section from the end of the bend to the tip of the hook. Most hooks will have a barb near the tip of the hook. I tent to either buy barbless hooks or file these off to protect the fish as much as possible. Gape – The gape is the inner distance from the hook to the point to the shaft. Bite – Finally, the bite of the hook is measured from the tip of the hook to the inside of the bend. My Favorite Trout Hooks are the Gamakatsu Trout Worm Hook, Size 10. Hands down the best hooks on the market at the moment. Hook sizing is broken down into two different scales. The first scale is the Aught scale and the second is the normal scale. I fish freshwater so will focus on the second scale but here is a quick overview of each one for comparison. Aught Scale: This mainly focusses on larger hook sizes used in saltwater and sport fishing. Each hook is measured with a /0 at the end of it. for example, you might use a 5/0 hook for tuna fishing but as the numbers go up so do the hook sizes. Normal Scale: The opposite can be said for the normal numbering system. As the numbers go up the hook size gets smaller. You might use something like a size 12 or 16 hook size for smaller brook trout. As this guide is for trout hooks we are going to use the second scale. I mainly use smaller hooks as I tend to fly fish a lot and most freshwater patterns are tied on smaller hooks. When I float fish with bait I also stick to smaller hook sizes. This allows for a more natural bait presentation and tends not to spook the fish. The only other hook type I will use, is when I fish something like freshwater prawns for Salmon returning to spawn, is a longer shank hook so I can hold the bait in place during longer casts. The hook gauge is the thickness of the hook wire itself. This is a standard measurement and is calculated in multiples. A small trout hook has a much thinner shaft than say a large saltwater hook. The gauge is calculated by using X. So a larger hook can be 2,4,6X thicker that a smaller trout hook. Thick Gauge Hooks like 2X,3X,4X are used for larger fish that need a bit more work to land them. They are especially useful when you are fishing around snags and boat docks where you have to pull the fish a lot harder than normal to get them into the net. I always try to fish with the smallest hooks possible on the day as this allows for better bait presentation and accuracy during the cast. I am a creature of habit when it comes to fishing and tend to stick to the one hook size most of the time. I do however switch occasionally when either the conditions call for different tactics and bait or I spot a monster trout lurking within casting distance and I feel its worth a shot at hooking it. 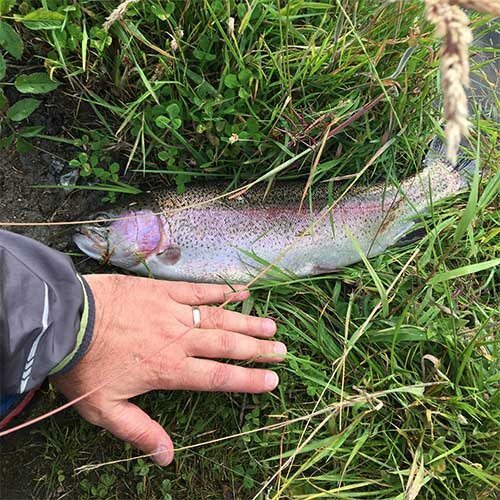 With larger trout, you only really get one chance to hook the fist so by carrying a selection of hook sizes and setups you are giving yourself the best chance on the day. Bait fishing and fly fishing always calls for a single hook. As mentioned barbless is my preferred choice especially for trout. I use standard pattern hooks for fly and small bait presentation such as maggots and sweetcorn. Longer shank hooks come out of the bag in some rivers for larger trout if I use worms or some of the manufactured baits on the market. When in season and I get the chance to get to the river I use longer shank hooks on the end of a float line for Salmon. I use scented prawns on these rare occasions and a longer hook shaft allows me to present the prawn beautifully to the fish, resulting in some awesome takes and fishing. All my fly fishing is done with single hooks and while I may have up to 4 flies on the line they will all be one single small hooks. I practice catch and release as much as possible and all fish go back unless they have swallowed the hook or gotten damaged during the fight. Single hooks are the least damaging to trout especially if you either use barbless hooks or file off the barbs before you fish. You will sometimes see spoon spinners using larger single hooks but this is not as common nowadays. Treble hooks are most commonly found on lures and spinners. Any of the Mepps range of spinners will all have small treble hooks at the end and any of the floating and diving trout lures will have a pair of trebles attached to hook that prized trout. A treble hook is simply three hooks joined at the shaft and molded into a single eye for attaching the line. Treble hooks tend to do a fair bit of damage to the fish – especially if they swallow the hook so take as much care as you can when removing them from your catch. These are my go-to hook for all types of freshwater fishing especially trout fishing. A couple of the rivers I fish during the season are barbless only which is a great rule and put in place to protect the fish stocks as much as possible. I will often never take the fish out of the water when I catch it and by using barbless hooks I can easily release the fish from the net with minimum damage to the mouth area. 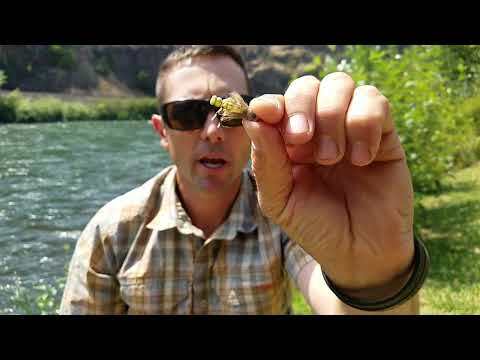 Here is a great video from Red’s Fly Shop showing you how to properly debarb a trout hook. We highly recommend doing this before you head out fishing. There is little difference in the number of fish you loose with barbless hooks but it is so much better for the health of the fish when you release it. All the hooks listed above will cover you for the majority of freshwater fishing on most trips. These are my go-to trout hooks and have served me very well over the years. If you have a preferred hook then drop a comment below and we will take a look.